John Hartnett has been deeply involved in the world of fine furniture since opening up his first antique shop and restoration business in 1962. The family business can be traced back to the 1880s when his great grandfather was a cabinetmaker in Paris. Today the company A & J Hartnett & Sons exports a range of exquisitely made cherry and maple music stands from its workshop in Brighton to discerning customers around the world. The stands themselves are complicated enough to produce but the transportation and packaging of these delicate pieces is another story. 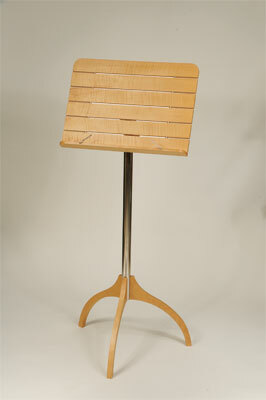 John's friend and colleague Colin Sullivan was helping to make these music stands, and exporting them in great numbers to the United States among other places, where they were proving very popular. One problem was constantly presenting itself when shipping them, however. Not only did international couriers charge by weight, they also charge by volume, and a music stand's tripod legs splay wide enough to increase the overall package size, making delivery costs prohibitive. Presented with the challenge of being able to deliver these music stands to the US while decreasing the volume size, Colin set to work. "Simplicity was essential so someone unskilled could easily fit the legs on. The fitting proved to be a novel solution to a difficult problem. 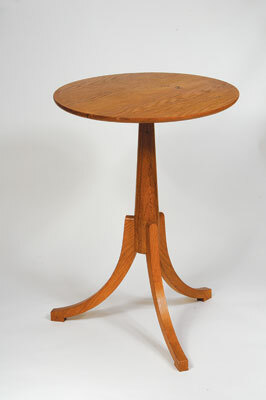 It was also used on small three-legged tables like the Shaker Lamp Tables and a larger four-legged table. I may have got the inspiration from the Stanley bedrock system where a tapered screw is used to lock the frog to the sole of the plane. The beauty of my fitting is that it can be made in any workshop, on an ordinary pillar drill or simple metal-turning lathe. 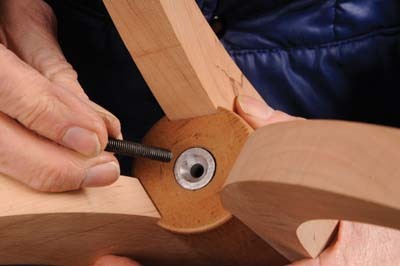 It can be used as a knock down fitting or simply as a cramp for gluing the legs on. It then serves to hold everything together even if the glue breaks down. 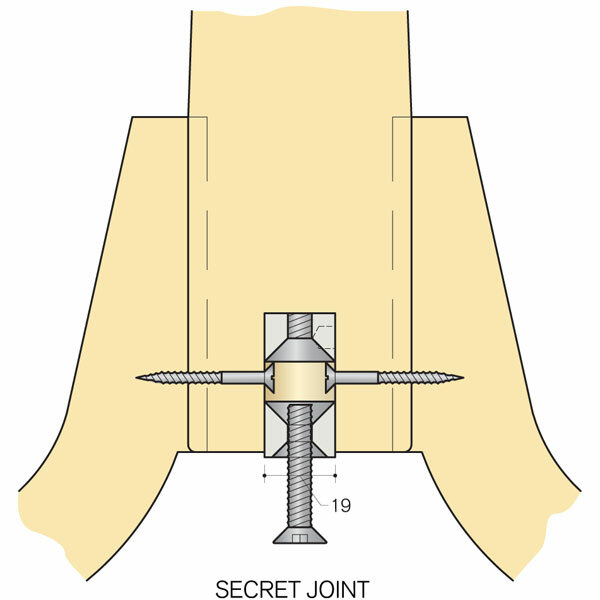 Much of the success lies in the secret joint used to attach the legs to the column for assembly by the end user. Fourteen years down the line and 555 music stands later (each one is numbered) there have been no complaints or reports of damage due to joint fatigue. 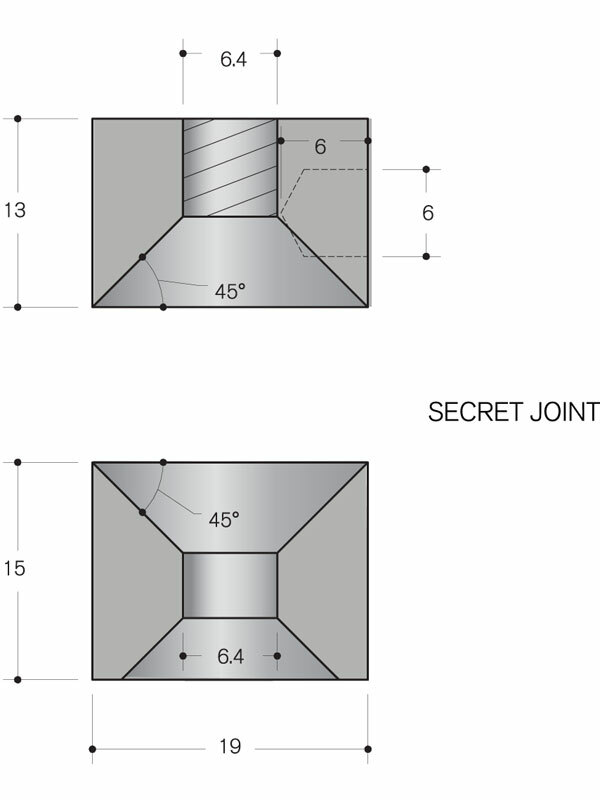 The following details are intended to show in principle how this fitting can be used. The sizes can be adapted for your application." I used 3/4in diameter mild steel rod, cut into two 15mm long billets. Drill a 6.5mm diameter hole in the centre of one piece and countersink one side to the full 3/4in width. 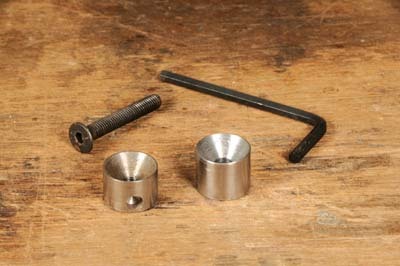 Create a similar countersink on the reverse side to fit an M6 bolt head. 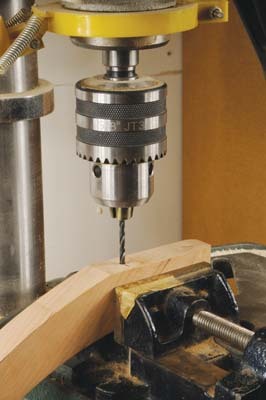 On the second billet, drill through the centre and tap to accept an M6 thread with a countersink on one side to the full width of the billet. 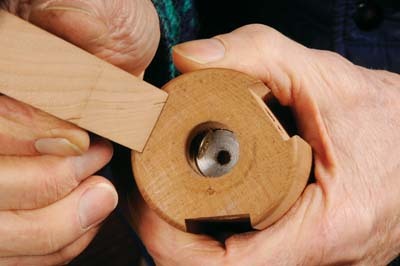 I began by turning the column between centres on the lathe, leaving a stub end 28mm in diameter at the top. 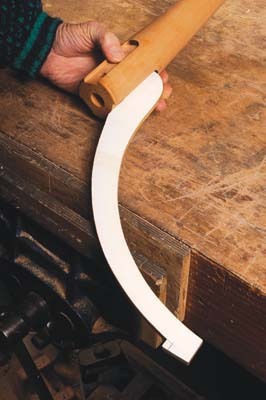 This was left for gripping in the three jaw chuck of the lathe and would be used later for fixing the table top. I then made a simple jig to route three slots on the column using a 3/4in cutter to produce a 7/8in wide slot 3mm deep. 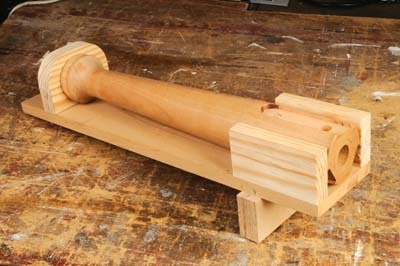 This jig fits onto the lathe bed under the column - with the column held between the chuck and the tailstock. It must be central with the column. I drum sanded the inside of the curves and disc sanded the outside of the curves. 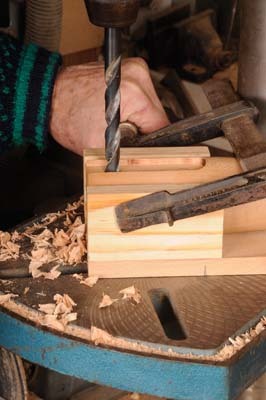 The three chuck jaws are then used as a register to position the column for routing. 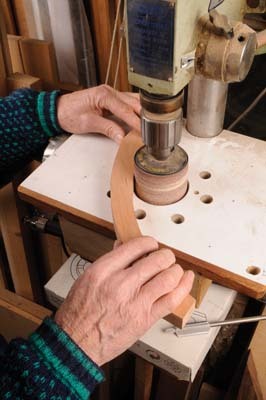 It's essential to hold the column from turning and this was done with a simple jig that fitted tight on one chuck jaw and is cramped to the bed. 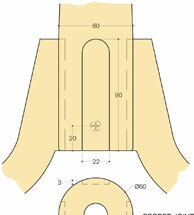 The top section is released for the chuck to turn the column one third. 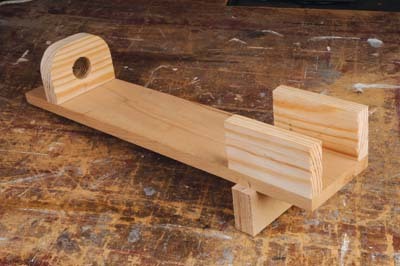 To drill the 3/4in hole in the base of the column I made a jig to fit on the pillar drill. It was cramped onto the table and hung down vertically to support the column. 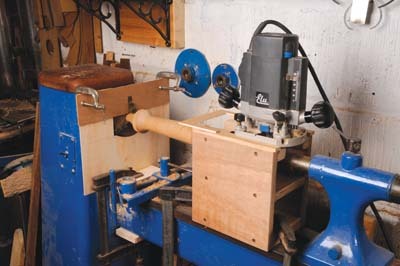 The 3/4in drill can then be lined up with the centre that was used by the tailstock. I used a flat drill bit that was 7/8in wide ground down to 19mm and cut short to allow as much height as possible for getting the column onto the drill press. 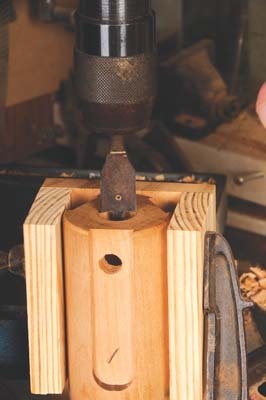 The same jig can be used for drilling the holes through the slots where the three screws will go. This hole needs to be just big enough for a no. 6 screw head to pass through it. The no. 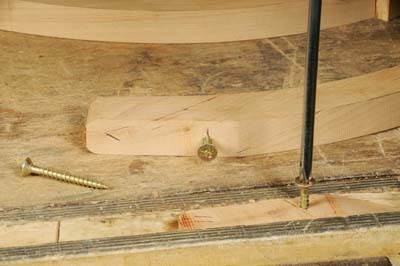 6 x 50 screw position on the legs is exactly adjacent to the holes in the slots on the column. I drilled the pilot holes for these screws on the pillar drill using an ordinary drilling vice, to insure they are square to the face of the leg. Take care with putting in the screws because the leg can easily crack, so grip it in the vice or place a cramp just where the screw goes in. Adjust the depth of the screws so the head just shows in the hole in the column where the fitting is. 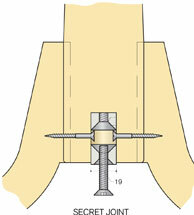 Put the threaded screw draw block into the column and check that the screw on the leg can pass over it. 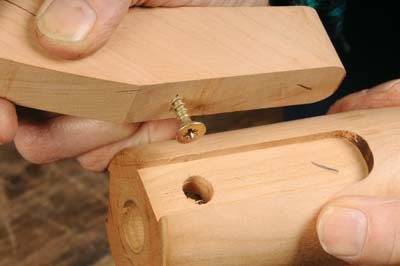 Do this to all the legs and then put the other draw screw block on top, insert the bolt and tighten up. 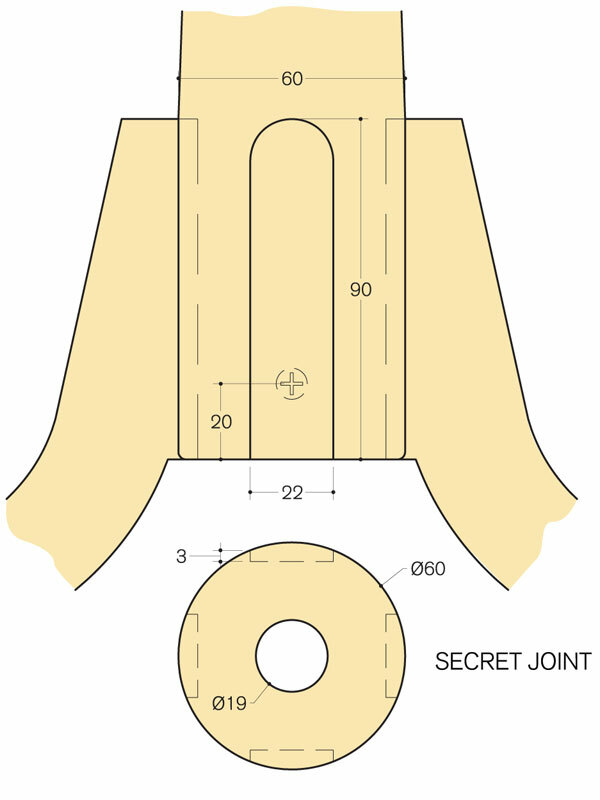 If any of the legs move in the slot adjust the leg screws until the tension is equal on each leg. I was surprised by how ridged the legs were the first time I put this fitting together. 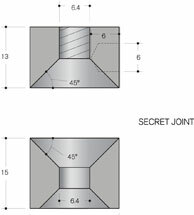 It has the advantage of drawing the legs to the centre of the column and not relying on the strength of the column alone. 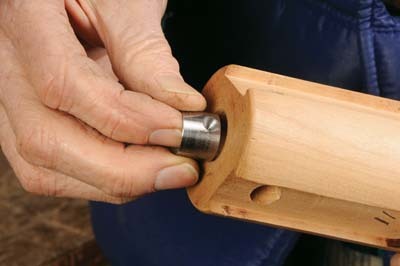 This fitting can be used with a metal column by making a wooden bush to fit inside the tube and scribing the legs to fit the diameter of the tube.